Hi everyone! For this week’s Fit Review Friday, I have a new size in the Equipment Brett. The brand Equipment has become synonymous with the silk shirt, and as a lover of both silk and shirts, a wardrobe full of scrumptious Equipment silks has lived in my day dreams a time or two. Unfortunately, meant to fit generously, the smallest Equipment size (xs) in the smallest of fits (Brett) has still been pretty hard for me to pull off. So when I saw new size xxs available for the first time, I had to get it in my silk-loving hands. For reference, you can find my measurements and sizing information here. Brett at Equipment, Shopbop, & Amazon Fashion. Let me begin with a quick rundown of the basic Equipment shirt fits. Equipment’s three basic fits are the “Signature”, “Slim Signature”, and “Brett”. The Signature is just that, their signature fit. It features two large flap pockets at the chest, and is very generously sized in both width and length. The Slim Signature looks exactly like the Signature, but in a slightly shorter and narrower fit. The Brett is slightly shorter and narrower than the Slim Signature, and unlike the other two, only has a single chest pocket. My favorite fit is definitely the Equipment Brett, not just for it’s smaller fit, but also because I’m a big fan of the look of a single pocket on a shirt. In terms of a shirt meant to fit generously, I think this size finally fits me close to the way Equipment intended. 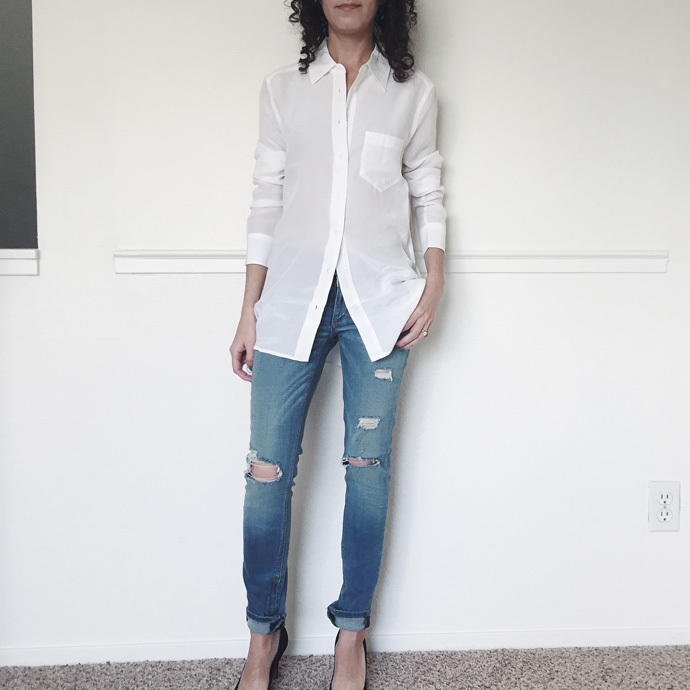 I love the length, especially with the last two buttons left undone to allow the shirt to open and show a little leg line. The shoulder seam just barely hangs off my natural shoulder, which is impressive considering I’m so narrow in that area. The sleeves are long on me, which is to be expected since this is not proportioned for petites, but I found this no problem considering 1) I usually push my sleeves up for presence anyway, and 2) the cuff diameter is really small, so the sleeves don’t fall past the wrist when buttoned closed. I’ve also found sleeve length to be a personal preference, as I certainly hear from people who like their sleeves a little long for an intentional, dramatic effect. Besides the narrow cuff openings, I also found the sleeves to be pleasantly slim, which helps balance the generous torso. Of course, thanks to the lovely weight of the silk, the torso drapes beautifully, despite being oversized. Another area that pleasantly surprised me was the bust button placements. Fellow petites will probably be familiar with the phenomenon of awkward button placements on non-petite shirts. One button feels a little too high and stuffy, but the one below practically exposes your entire chest. 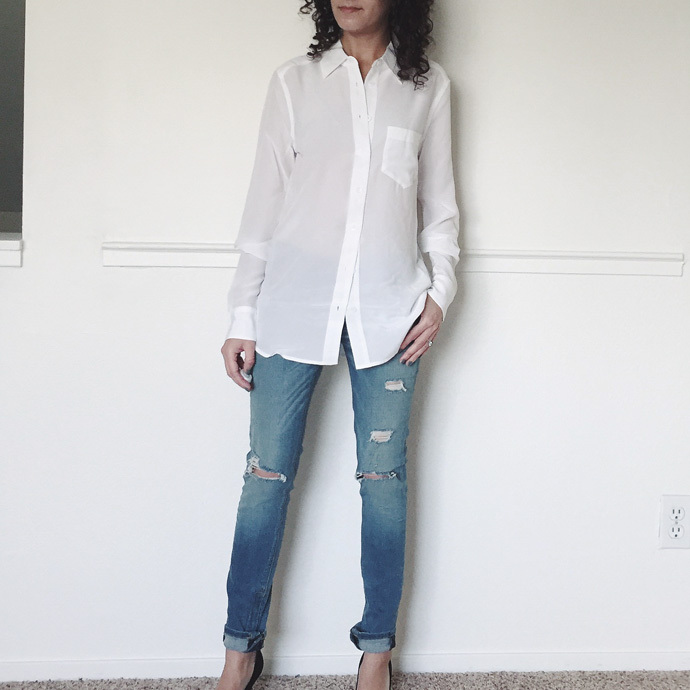 With the top 3 buttons undone, everything felt secure, but could still easily reveal a hint of a pretty lace bra or fun camisole if you’re so inclined. Photo #3 shows how much bra is exposed when the fabric is held open, but way less than that is actually exposed during normal wear and movement. Overall, I’m very happy with this new size and am hopeful for more colors and prints, specifically in the Brett! Hi Kelly! Keep the fit review Fridays coming :). Related question on button placement I have EXACTLY the problem you described. Any experience altering button placement on button up shirts? Thank you. Hi Jothi! I usually solve this problem with a camisole, lacy bra I don’t mind showing off, or fashion tape. A tailor could add a new button & button hole for you, but it may distract from the symmetry of the rest of the buttons. I’ve also seen people add clear plastic snaps, but they will show if you ever decide to wear the shirt open below where the snap is placed. 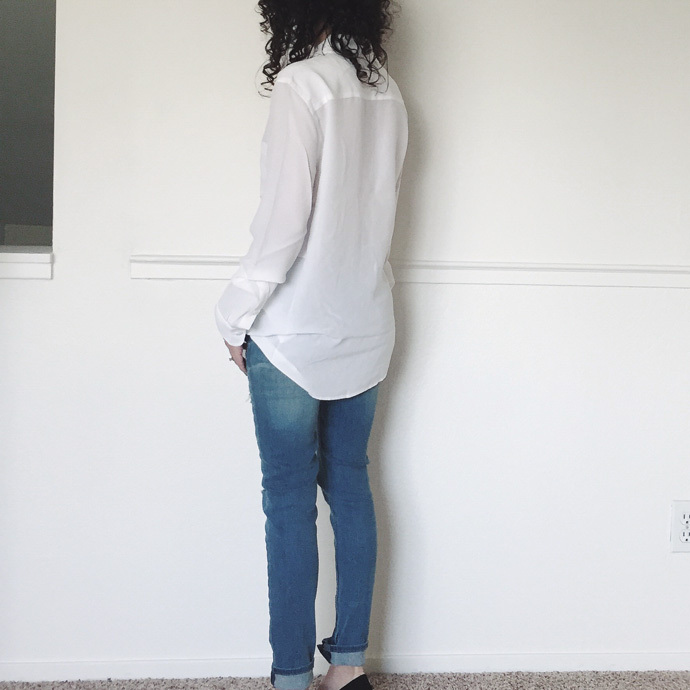 Your best bet is really to try and find a brand/size that is well placed for your figure (easier said than done, I know), or go the custom route. 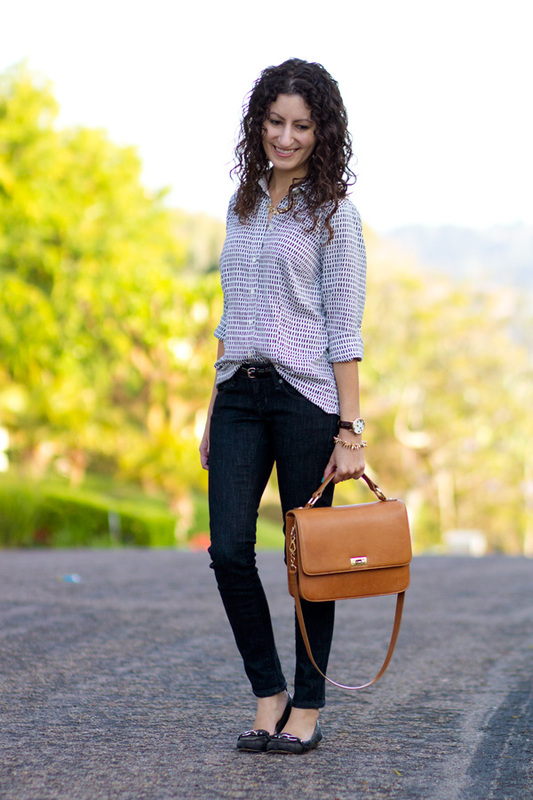 This silk shirt does sound perfect for petites who struggle with finding shirts that fit well! Thanks for sharing!